This is a guest feature penned by our friends at block42. Devv (build by the company Devvio Inc.) claims to be the world’s fastest blockchain (over 8 million transactions per second) and addresses to solve all today’s major blockchain challenges. Different kind of proposals require different majorities and parties to agree (examples can be found in the Bluepaper). Devv’s scalability is implemented through a multi-tier blockchain approach. It is based on a system where there is one Tier 1 Blockchain (T1) and many Tier 2 Blockchains (T2). The T2 networks are shards. T1 and T2 are comprised of independent nodes. The blockchains comprising T1 and each T2 comprise the entire Devv blockchain implementation. The T1 blockchain controls the primary Devv blockchain, has a longer block time and a larger block size than the T2 blockchains. T2 blockchains validate and transmit only a subset of outgoing transactions and transmits those transactions to the T1 blockchain over time. The extreme high throughput is achieved by combining the output of those T2 blockchains in another separate blockchain. Devvio argues the main purpose of blockchains is to maintain asset balances and therefore processing/computation should be done off-chain, only updates to the balances should be stored on-chain to provide a robust, trustless and transparent system. Devv does not innately need to charge transaction fees. Devvio may charge a small fee like Ripple does to avoid spam or DoS attacks. These potential fees can vary on network load. Basically Devv provides a publicly available blockchain with pseudo anonymous privacy, which is the same as for blockchains like Bitcoin or Ethereum. In addition Devv has an optional methodology for private transactions in cases where it is wanted. The methodology is trust-based and it is implemented via the INN. A user who wants to send a private transaction has to send Devvnero to an privacy account of Devvio and send an off-chain encrypted message to the INN containing the target wallet. Subsequently the INN creates a transaction on the Devv network containing the correct amount and target wallet address. This enables transactions that are private to the public but also compliant with government laws (KYC, AML, …). The Immediate Node Network (INN) is operated by Devvio Inc. and represents a trust-based network. It is built on top of the multi-tier network and allows instant transactions below one second. In addition to that the INN enables fraud/theft protection, loss prevention and private transactions. The INN uses a secondary cryptocurrency which will be called Devvnero. Devv will utilize a specific, secondary type of cryptocurrency class called Devvnero to enable more protections on transfers. 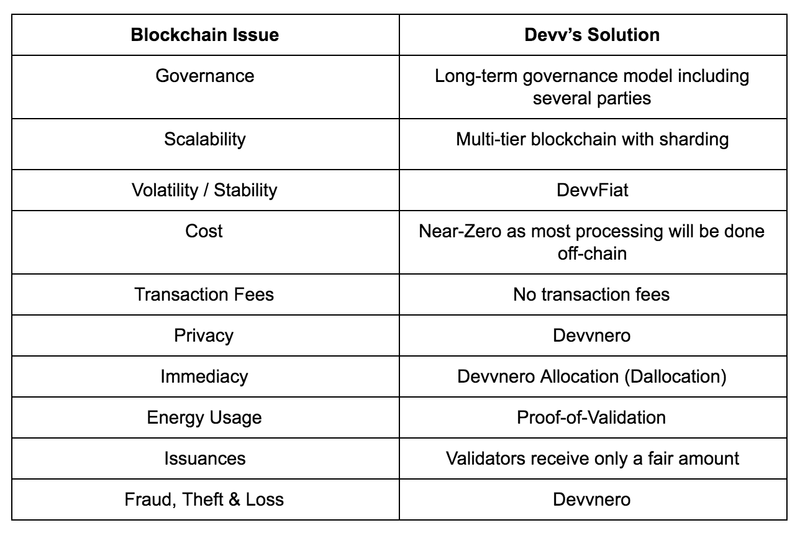 No user is ever required to send a transaction in the form of Devvnero as it is a completely optional feature of Devv; however, the use of Devvnero can provide valuable protections based on trust of Devvio (in the same way that people trust credit card companies to protect their interests when making online purchases). An account with Devvio is required to use Devvnero, so that its protections can be verified (KYC required). The Devv protocol has the ability to ensure stability through a concept called DevvFiat, a nonvolatile one-to-one fiat backed representation of a currency. This is accomplished through the use of the “Dallocation” (Devvnero Allocation). Amounts that are transferred into a Dallocation by a user can be converted through an exchange mechanism into DevvFiat. DevvFiat can take a number of forms such as DevvDollars or DevvEuros, for example. For every DevvDollar that is issued by Devvio, as an example, one US Dollar will be put into an escrow account controlled by Devvio. The escrow account will be audited, and can be publicly verified as to its integrity from the beginning. DevvFiat can also be used to wrap other assets. A Dallocation can contain DevvBitcoin, DevvEther, or even DevvGold. A Dallocation can also contain DevvBaskets that represent 12 groupings of fiat currencies and other financial instruments which can have even less volatility than the US Dollar. The Dallocation sets aside Devv, DevvFiat, or other tokens to be verified immediately by the INN. The Dallocation can be utilized for immediate transactions and represents Devv held in the user’s wallet that the INN can transfer through its payment channels based on a user’s actions (such as a credit card purchase or mobile app purchase). A user can send an encrypted originating message in order to create the Dallocation for a Devvnero Wallet, along with an indication of the INN’s permissions for sending Devv from the Dallocation. Those transactions do not utilize the private key for the Devvnero Wallet, but instead nodes on the INN use their own private keys to create transactions that can be validated by T2’s. Devvio can therefore allow the ability to guarantee payments immediately. Devv uses Proof-of-Validation for its consensus mechanism, where validators (which are the consensus providers) create blocks comprised of transactions, and then collectively validate each block by sending validation messages. Validators chosen by Devvio Inc.
Devvio will have a different philosophy on rewarding validators. Validators will only receive a fair amount of tokens which will be comparable to other cloud services, but compared to other blockchains the validators won’t receive a big stake for doing validations. Devvio implements its fraud, theft, and loss solutions with an escrow-like functionality. Only Devvnero wallets have those features, normal Devv wallets do not. Devvnero wallets have an escrow like functionality implemented. That means if someone sends funds to another wallet, these funds are in an escrow for a certain period of time (pre-defined by the user) before the recipient can access them. An user can have multiple Devvnero wallets with different escrow times. Wallets can also have a whitelist of destination addresses where sending the funds will have no delay (no escrow). As long as the funds are in the escrow, the owner of the sender wallet can contact Devvio to reverse the transaction. To do so he must prove ownership of the wallet via KYC (Devvnero wallets are always linked to a KYC). If private keys to Devvnero wallets get lost, Devvio can also be contacted and private keys restored (after ownership verification). Private keys of normal Devv wallets can not be recovered (same as e.g. Bitcoin). Given that the Devv blockchain is used to represent digital representations of value, and is intended to implement trustless transactions in a robust way, the implementation of smart contracts is designed simply to improve capabilities in representing those digital assets. Smart contracts, in the Devv protocol, are implemented either as part of the core protocol itself, or in the form of Smart Coins (linked together) which provide added functionality. Smart Coins represent other types of ownership and identity beyond Devv itself as well as implementations for on-chain processing and operations. Smart Coin implementations have to be purchased from Devvio Inc.
Tom Anderson (CEO): Tom is an experienced entrepreneur and previously founded Novint Technologies, a robotics company that created the world’s first consumer 3D touch device. He was one of the earliest pioneers in the field of haptics (adding the sense of touch into computers/VR). He led fundraising of over $34 million, licensed tens of millions of dollars of game development, and took the company public. His Novint patents were sold to Facebook. He founded Devvio in Albuquerque, New Mexico, USA. Ray Quintana (President): Before joining Devvio full-time, Ray was a General Partner and Head of European and Corporate Operations for one of the top performing early stage venture capital funds in the United States, The Cottonwood Technology Fund. He has more than 20 years of experience in venture capital, global technology investment, company creation, company building, valuation and strategic financing. Bill Anderson (CTO): Bill has over 17 years of experience in high tech industries. He led the development, licensing, acquisitions and integration of over 100 haptic enabled video games and has managed many large teams across multiple technical fields. Nick Williams (Director of Blockchain Development): Nick is an expert developer in the fields of cryptology and systems design. After receiving degrees in math and business from MIT, Nick spent over 10 years managing software development teams for a number of telcos and startups. He has extensive coding experience across many different domains. Nick’s perspective is shaped by deep interest in cryptology, systems engineering, and business strategy. V. Gerald Grafe (IP Counsel): Gerald has 30 years’ experience working with computer technology, intellectual property, and startup companies. Michael Koenka (Director of Marketing): Michael is a crypto launch advisor for senior executives, founders and top tier investors. Singularity University, Rockstart AI Accelerator, and the European Space Agency trust him to bring out the best in their projects and people. Shawn McKenney (Lead Software Engineer): Shawn brings almost 20 years of experience developing high performance, distributed scientific algorithms and applications. Martin Hensley (Database Developer): Martin is an economist with ten years of experience in data science, high performance computing, software development, and product management. Douglas Radecki (Lead UI Designer): Douglas is a seasoned User Experience Designer who enjoys working on big problems and the fuzziness associated with tackling such large challenges. Eric Renz-Whitmore (Community Lead): Eric is an Ecosystem Builder who believes that sustainable development of any venture isn’t possible without a thriving community. Anish Mohammed: Security and cryptography expert with 18 years experience in the capacities of a researcher and a consultant, and entered the Blockchain ecosystem as one of the founding members of UKDCA. He has advised and worked for various banks and financial institutions including AIB, HSBC, Lloyds and Zurich. He is also on the advisory board for Adjoint, Arteia, Hyper-loop Transport Technologies, Privacy Shell, Collider-X, Piggi, and IEET. These days he is more focused on projects that involve security vs scalability vs consensus of Blockchain, and using smart contracts for AI safety and Cryptoeconomics. Nimish Patel: Serves as MSK’s Vice Chairman. His primary focus is corporate and securities laws. Anderson Tan: Serial entrepreneur, angel investor and VC. He exited 8 companies. 2 of his own got acquired and the rest via angel investment. He has 13 unicorns under his portfolio including SpaceX, Hyperloop One, Pinterest, Lyft and Palantir. He currently is the Chairman of Alpha Omega Ventures. Partner at Launchgarage, Co-owner of Proudcloud. Partner/investor at MicroVentures. He was the advisor of Holochain during the ICO and now advising Devvio. Greg Scantlen: Has been designing, building, and maintaining High Performance Computing (HPC) Systems for over thirty years. Andree Jacobson: Andree is currently a Cluster Infrastructure Engineer for Tesla. Andre previously was the CIO at the New Mexico Consortium in Los Alamos and ran the successful PRObE project in which Los Alamos decommissioned supercomputers were repurposed for systems research purposes. Andre spent significant time in the non-profit / government / academia interface designing and implementing hardware architectures which support various research activities utilizing High Performance Computing. Solve Maxwell: Avid cryptocurrency trader and blockchain protocol investor. He has been working as a blockchain, cryptocurrency, and ICO consultant since 2016 and has been in the Bitcoin space since 2011 as a speculator and investor. Devvio wants to fix all issues of the blockchain in a single solution. Their goals are extremely ambitious and it’s very difficult to say if they can deliver on their promises or not. They certainly have unique and innovative approaches to tackle those problems (scalability, privacy, fraud/theft/loss, …). If the team can really deliver their objectives, they might be able compete with other large players like NEO, Cardano, Ripple and EOS. It’s definitely worth reading the paper(s), features and tech are explained very well and in-depth. This feature has been brought to you by our friends Block42. Make sure to follow their blog and follow them on Twitter. We rate Devv in our highest rating category – a Stellar project. A solution to combat fraud, while not exactly trustless, will be a massive plus for adoption by institutes. Besides this, the team has a very solid blend of technical expertise and venture capital experience. We’re particularly enthused by Ray Quintana’s involvement who despite being legendary in the VC world has joined the project full time. His contacts will be invaluable. While the hardcap is large we believe it’s matched by the team’s ambition and talent. We agree with block42’s point that this will be a chain to compete with the heavyweights like NEO, Cardano, Ripple and EOS. We’ve caught this one very early – the project is only collecting for their first seed round right now. Make sure to follow their Telegram to keep up to date on the latest from them. Note: No payment was made by this ICO for this article. We always label our sponsored content clearly at the top of the article. This article, nor any of the content found on this website, should be considered investment advice. Always do your own research.